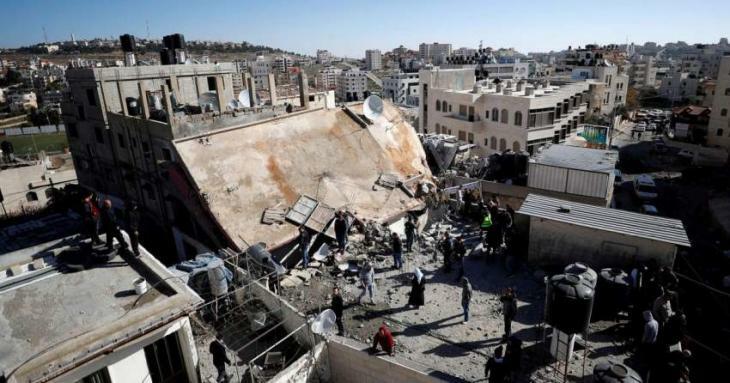 RAMALLAH, (UrduPoint / Pakistan Point News - APP - 17th Apr, 2019 ) :Israeli army raided the West Bank village of Kobar Wednesday morning and demolished the home of Saleh Omar Barghouti, who was accused by Israel of carrying out a shooting attack last December. Saleh was gunned down in a military ambush on Dec. 12, 2018 after a manhunt over allegedly carrying out a shooting attack that killed an infant and injured seven settlers on Dec. 9 last year. Kobar Mayor Izzat Badwan told Xinhua that this was the fourth house demolished by Israel during the last two years, saying "such demolitions are considered crimes under the international law, but it won't stop the Palestinian people's determination and commitment to their rightful cause." Local sources said that the Israeli soldiers fired live ammunition and tear gas canisters towards residents while no major causalities were reported. In March, Israel demolished the home of Saleh's brother Assem Barghouti a few weeks after detaining him, saying he is suspected of killing two Israeli soldiers near Ramallah on Dec.
13, 2018, a day after the killing of Saleh. Israeli Army Spokesperson Avichai Adrei affirmed in a tweet that "the demolition targeted the home of Barghouti, who carried out with his brother an attack in Ofra settlement on Dec. 9, 2018 that killed an infant and injured seven others," and "the Israeli army will continue to work to halt terrorist activates and maintain security in the region. "Rights groups say Israel's policy to demolish the family homes of Palestinians does not serve as a means of deterrence, but provokes vengeful acts by both sides. While Israel demolished homes of entire families of individuals accused of being involved in attacks against Israelis, it does not apply the same measures to Israeli settlers who were involved in fatal attacks against Palestinians, the groups noted.